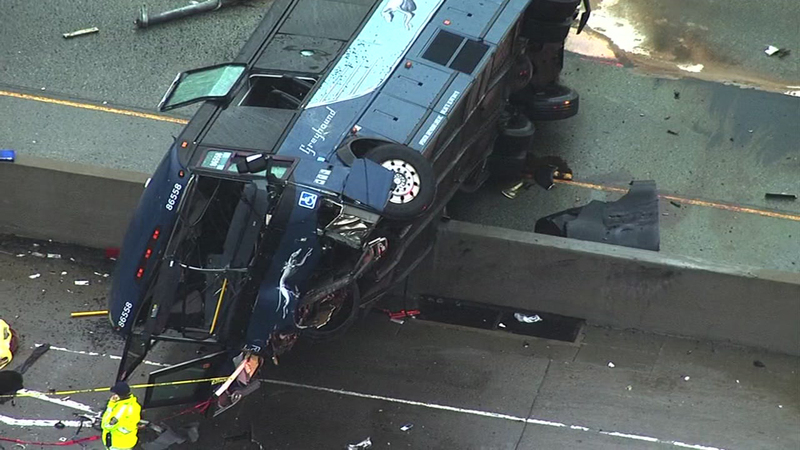 SAN JOSE, CA -- A Greyhound bus rolled onto its side during a rainy Tuesday morning commute in Northern California, killing two people and injuring 18 others, authorities said. The bus flipped on its side while traveling north on Highway 101 in San Jose around 6:40 a.m., according to the San Jose Fire Department. The bus carrying the driver and 19 passengers flipped onto the center divider, fire Capt. Christopher Salcido said. Authorities were investigating the cause of the accident, but no other vehicles were involved. Five people suffered moderate injuries, and 13 others suffered minor injuries, Salcido said. Several of the injured were transported to area hospitals. TV helicopter footage showed what appeared to be two bodies covered with yellow tarps near the front of the bus. Emergency workers in bright-yellow suits and firefighters worked near the bus in the rain, and fire trucks and ambulances were parked nearby. The accident snarled a morning commute already slowed by rain, backing up northbound Highway 101 for several miles.